It’s only 2 days until one of my most beloved holidays here in the United States, Thanksgiving. A day for families far flung around the country or close-knit to come together and be thankful for all that we are be blessed to have. Whether you’re thankful for your family, a roof over your head, a car that gets you to work in one piece, or perhaps something as simple as a pen and paper to journal your thoughts, Thanksgiving is an opportunity to thank both the extraordinary and mundane. While I’m thankful for many things is my own life, I didn’t want to drone on in length about the “Thanks” that I have to give, so instead I created a short assignment that any teacher (or parent) could give their students and children as a quick way to reflect, share, and comment on what we all have to be thankful for. I’m not nearly as green as this in real life, but I’m thankful that I have the time and tools to be creative in small bursts throughout the day. I’m going to call it, “10 Seconds of Thanks!” And the rules are simple, straightforward, with one big requirement, your efforts must be shared online in some way, shape or form. If you’d like to play along or have your students complete the assignment, please feel free to link back here so I can comment and share with others! Using a timer, write what you’re thankful for in just 10 seconds! Anything and everything that you can think of being thankful for is fair game, but stop at 10 seconds. Share what you’ve written on a blog, wiki, or some other digital space that others can comment on. Bonus! 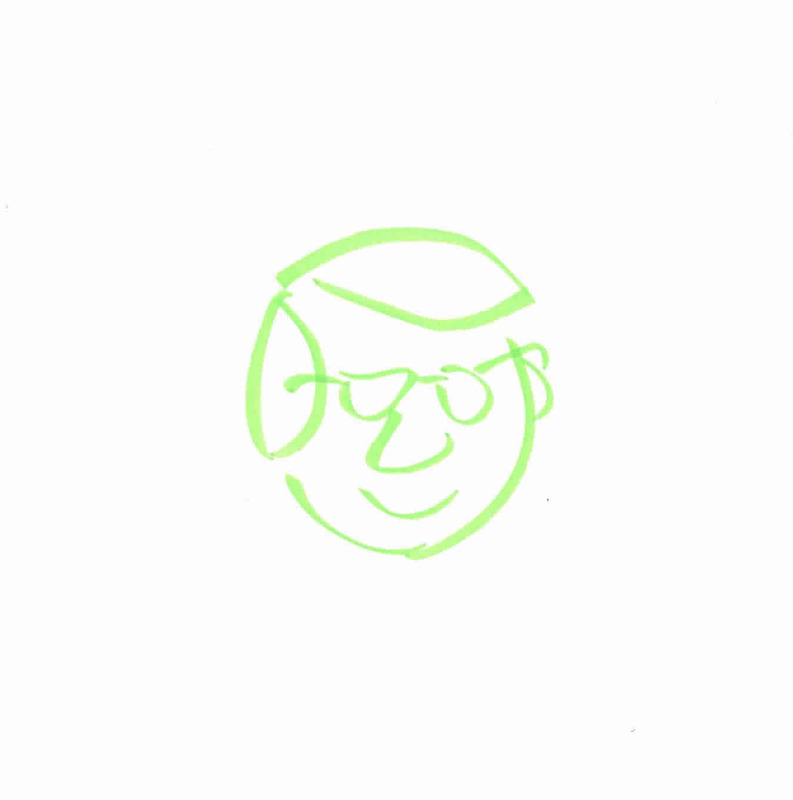 Complete a 10 second drawing of yourself to accompany your writing, inspired by the November 19th, 2012 Daily Create. Besides, being simple & quick, it’s relatively low-tech in application; you could easily do the assignment in a single shared Google Doc, or post some thoughts to Corkboard Me to produce a nice collection of thanks from your entire class. The real payout though comes in the conversation, collaboration, and potential for creative writing either directly afterwards or when you return from Thanksgiving break (if you and your students are in the U.S. that is). You could use the simple short writings as prompts for students to compare their “Thanksgivings” with someone else in class, or even start a small persuasive piece on what the most important items to give thanks should be and why based on your community of learner’s own answers. That’s it! Simple right? I suppose it isn’t terribly inspiring or well thought out, but I enjoyed putting the small activity together. This should be no small thanks to ds106, the students and staff at my school walking through the halls today smiling as they wished everyone a “Happy Thanksgiving”, and the digital tools that I have to be able to create, publish, and share my ideas in less time than it takes to accomplish “bus duty” at the end of each day.